Wow. Just wow. Kit Watkins' music is justifiably known throughout the world as some of the most lush and restful music ever composed. And yet from the moment we put Unraveled into our music player, we were blown away by the sheer ferocity and depth of emotion emanating from our speakers. Did we say restful? Lush? Yes, of course you can find elements of these things in this towering album, but much more than that you can find passion, despair, anger, frustration, inspiration, and even redemption. Talk about your emotional rollercoaster, folks; this album has it ALL, packed tightly into three amazingly concise, enigmatic tracks of razor-sharp focus and precision. In the artist's own words: "Created in February 2003, this music was a response and reaction to the impending, illegal war in Iraq, and the associated French-bashing propagated by the right-wing in the U.S."
While the CD is indeed a political statement, it is also an evocative work of sparse sound design and texture, using found sounds from one of Kit's favorite composers, Maurice Ravel. Definitely one of Kit's more challenging works, this is the type of release that you will want to hear again and again, to hear the details that can only be found upon repeated listening. 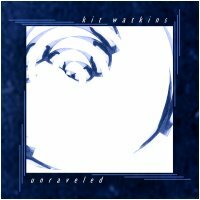 We at Earth Mantra are totally stoked to be bringing you the music of Kit Watkins via Creative Commons, and happily point to this album as a textbook example both of Kit's singular ambient mastery as well as his uncanny ability to produce music that can only be described as "important". Highly, highly recommended. Support the troops ~ bring them home.